AS RECENTLY AS seven weeks ago, I expected not to attend this year’s Gen Con until, on June 23rd, David Reid of MetaArcade asked me to reconsider. These are the folks bringing Tunnels & Trolls™ Adventures to mobile gaming, and I’ve written a little about them before. MetaArcade’s PR team wanted to bring me to the show, to feature me there at the booth. After the silly kerfluffle about my not being accepted into the Gen Con Art Show, I really didn’t have good enough reasons to go. Yes, I wanted to see friends, but professionally it made little sense. MetaArcade changed that. MetaArcade launches the Tunnels & Trolls Adventures app on the first day of the show, August 17th, and I’m coming along to help them celebrate. They jumped through the hoops to make the game available for free in the Apple Store for iOS and Google Play for Android. You’ll be able to play some of the mini-solos from Sorcerer’s Apprentice magazine and classic solitaires. If you want to skip the ads, the cost is pretty minimal even by my frugal standards. I am really kinda jazzed to see what comes next. The Adventure Creator (allowing you to script your own adventures) definitely excites me, although that part is still in the works. Even so, you might get a glimpse of where it stands while you’re at the show. David told me the first press inquiries specifically asked to talk to me. (Seriously?? Not David, not Rick Loomis?) I found this a little daunting, but David seemed to think I have plenty of stories to tell. As usual, my artwork takes pride of place, being what I am best known for. 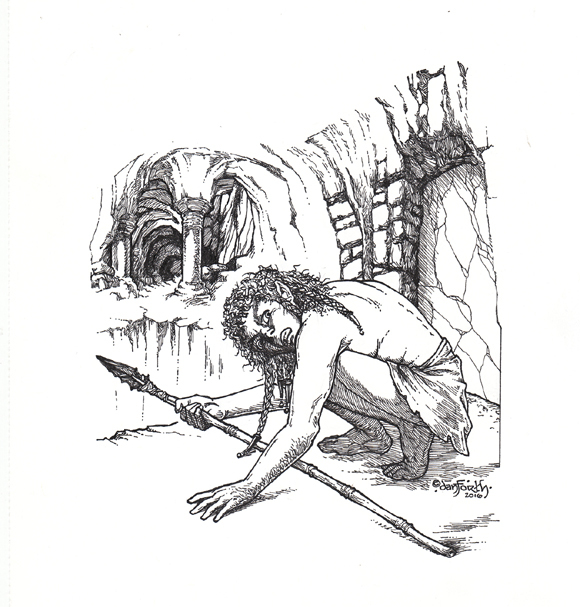 My art, old and new, features heavily among the images you see in the Tunnels & Trolls Adventures. Prospective interviewers might explore more than my industry credentials as an artist. I am among the earliest of the female professionals in the role-playing game industry, with credits in writing, editing, and design-and-development for both tabletop publications and computer games. I am a 1995 Hall of Fame inductee into the Academy of Gaming Arts and Design, and I have been working in the field for nearly forty years. So yeah, I guess I have a few stories I can share. As part of launching the Tunnels & Trolls Adventures, MetaArcade asked me to create a new painting just for the show. David gave me full creative freedom to choose the content, and after considering a few ideas, I hit on the perfect idea. Remember this, the picture on the left? 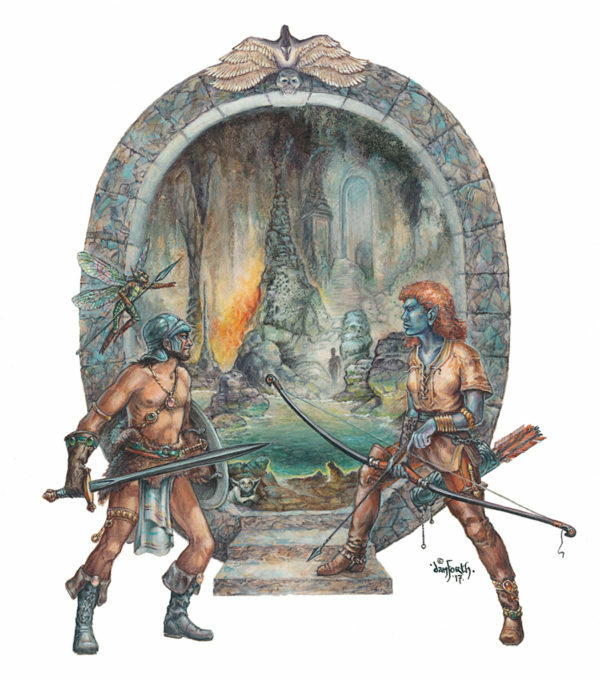 I wrote about it back when I sold the original, calling it “Into the Tunnels.” This picture perfectly captures the swords-and-sorcery aesthetic of the Tunnels & Trolls Adventures. A mixed group of adventurers have partied up for some mayhem, some mischief, and some sweet rewards at the end of their hair-raising escapades. I always felt it was one of my better images but nevertheless incomplete. I’d wanted a tunnel scene beyond that “moongate” from the beginning, but feared to ruin the clean lines of the main composition. Therefore, I did the background image as a separate drawing, a stalactite-draped cavern, and we popped it into the moongate’s “window” after-the-fact. It worked out, and the results looked like the yellow box image on the right: sufficient for the purposes of publication, but a little unsatisfactory artistically. 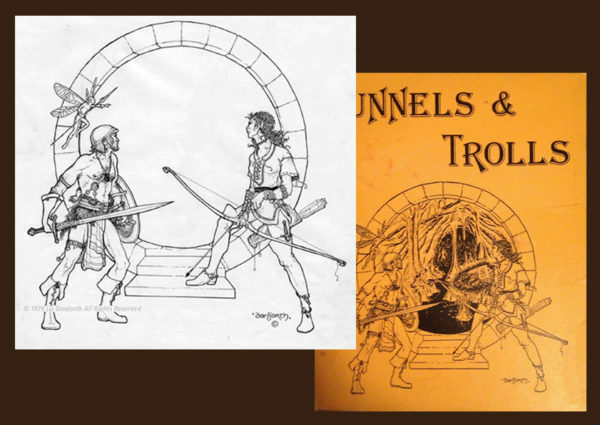 Revisiting the image for MetaArcade’s launch of the Tunnels & Trolls Adventures at Gen Con? This was just what the doctor ordered. I could make the piece look the way I wanted it in the first place, only even better. I would integrate the cavern into the whole, and this work would be in full color… and I would muster decades of additional experience as a painter. You are looking at the first public view of the results below. I’m calling this one “Front Gate.” Responding to their call to adventure, our heroes will cross that threshold, and their world will never be the same. Press folks will be able to get a conventional print of the picture, with a splash of logo soup that celebrates the launch of the Tunnels & Trolls Adventures app. Come say hi, at least; that will mean a lot to me. If you want something to purchase, I can offer a selection of large and small prints of my older art, some original works, and even some of my playmats (courtesy of Josh Krause of Original Magic Art). I am bringing less than if I would have for a booth in the Artist Alley. Space considerations limit me, but I also have other professional obligations during the show. Please bring your Magic cards to be signed, or for any of the other card games I worked on over the years. (My card list of 187 images is here, for Magic and other games.) Please be aware that I am asking $1 per signature for autographs on cards, for all the same reasons I talk about on my card-signing page here on the website. I will not charge to sign any items purchased in our Flying Buffalo + MetaArcade booth, but if you bring in a stack of 200 cards, I’m definitely going to hold you to the signing fee (and may ask you to bring me just 20 at a time if other people are waiting). 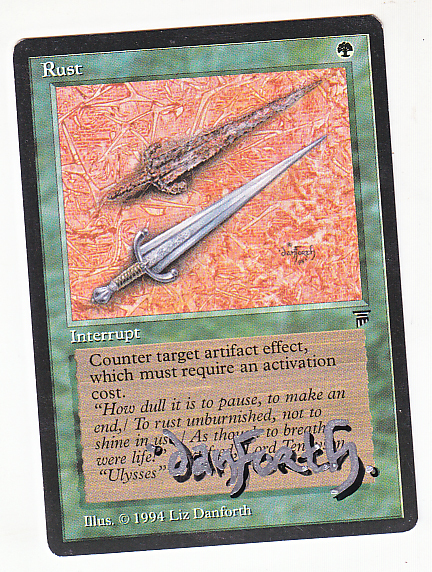 On the spot, you will be able to commission alterations or sketches on cards or playmats or in sketchbooks. If the request is complex, I might have to take your information and do the art after I come home. I will have a selection of white-back Artist Proofs of Magic and maybe even some AP Battletech cards with me for sale. You’ll find me in the middle of things: Flying Buffalo on one side, and MetaArcade on the other. I think this entirely appropriate as I have my feet in both camps! We will be at Booth #509 in a large 20′ × 10′ space near the Paizo people. Take the time to meet and chat with most of my stalwart co-conspirators on the Deluxe edition of T&T! Although Ken St Andre opted out of Gen Con, the other members of the Fellowship will be in attendance with me: Bear Peters, Steve Crompton, and Rick Loomis. You’ll be able to pick up a copy of the tabletop Deluxe Tunnels & Trolls rulebook if you missed getting one before now, and plenty of other goodies… even some pretty cool stickers to declare You Were There! Be sure to congratulate Rick Loomis of Flying Buffalo: he started attending Gen Con 41 years ago, and has never missed one since. No other publisher or vendor has been there for as long and so consistently. Rick is definitely one of the unsung heroes of the industry. I lamented the idea I wouldn’t be seeing old friends when I thought I would not make it to Gen Con 50. Now that I will be there after all? I am eagerly looking forward to seeing everyone! I hope I have time — and stamina — to do so. During the Magic Grand Prix Vegas in June, I found out just how much my crappy-bad knee and arthritic ankle have begun limiting my mobility. I can walk but not far, even with my noggin-knocker of a blackthorn shillelagh cane. Gen Con exhausted me when I was considerably younger! Friends have promised assistance if I need it, but I do dread the physical challenges of the show. So for now, my old friends, don’t freak out if you see me in a wheelchair, or if I don’t make it to all the after-hours dinners and shindigs I would have gone to in the past. When someone asked at GPVegas, “Liz, how’s your health?” I was honestly able to answer “Better than it looks, actually.” I anticipate some significant and beneficial procedures before the end of the year, and my doctor is pretty impressed with all the indicators to date. Unfortunately, it looks bad for now, but trust me, it’s gonna be better. By Gen Con 51, you won’t even recognize me. Come hunt me down for this one so you can take before-and-after pictures, and we’ll celebrate together next year! This entry was posted on Saturday, August 12th, 2017 at 1:04 pm	and is filed under Art, Commissions, Connectiveness, Conventions, Creativity, Design/Development, Freelancing, Gaming, History, MetaArcade, Mobile app. You can follow any responses to this entry through the RSS 2.0 feed. Both comments and pings are currently closed. I am tickled pink you are involved in this project, Liz. I must admit I wasn’t interested in this project until I heard that. Have a safe trip and a great time at GenCon. Great update! I hope you document & photograph the MetaArcade rollout. Charging for signatures seems totally fair given the collectible nature of cards. I hope procedures & rehab go well & swiftly. I got whacked by a bulging disk/sciatica thing ten years back; a first nasty “falling apart” shock, fortunately addressable by ongoing therapy but YOW, are airplane flights unpleasant. I’m betting I will be Ms Redundant of Camp Redundancy were I to try to document the MetaArcade rollout! Moreover, they’re coming into the show a day before I am (I’m arriving very last-minute) so I’d say watch their social media for the latest and greatest. I resisted charging to sign cards until I saw how pretty much every artist on the circuit had moved to that model. I would be leaving money on the table and cutting my own throat, when fans and players have come to expect it as the new normal, for better or worse. I broke my left ankle in my twenties while fencing (saber) and spent the next 30 years as a runner pounding the scar tissue into an arthritic mass. A handful of years ago, I tore the meniscus on my right knee, and that exacerbated my already-wonky gait until now, running is out of the question and even walking has grown difficult over the last few years. Aggressive exercise is the only thing that ever kept my weight within normal bounds, and the fact I can’t exercise it off is contributing to the laundry list of problems. Gettin’ old is a *** except for the alternative. I hope so too! With luck, I might find myself on that side of the ocean one of these days, so perhaps it wouldn’t be such a long trek for you too.